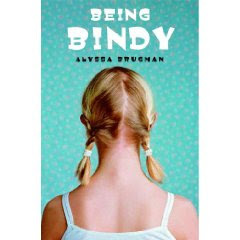 Being Bindy by Alyssa Brugman. Delacorte Books for Young Readers. 2006. Library Copy. Bindy and Janey have been best friends forever; and as far as Bindy is concerned, it's going to stay that way forever. Why should eighth grade change anything? But it does. Bindy cannot understand why Janey suddenly wants to sit with Hannah during lunch. She thinks it's boring. And when Bindy visits Janey's house for their weekly sleepover, she's surprised (and not in a good way) that Janey has invited Hannah over, and the three girls are going to the movies. What Bindy has on just won't do, so before she knows it she's got makeup layered on her face and is wearing a skirt that is way too short. The night ends in a disaster, with Bindy calling her father to pick her up and Janey furious. Bindy thinks that losing her best friend is as bad as it can get; but it gets worse. Bindy farts in gym class and becomes the school laughing stock and to top it all off, Bindy's father has begun dating Janey's mother. Bindy is experiencing the worst. year. ever. Yet she manages to get by. For one thing, while Bindy may not be as "grown up" as Janey and her new group of friends, Bindy doesn't care. When things began going bad at the movies, she had no qualms about calling her father to take her home. She's not going to change her looks or her clothes; she's not going to pretend to like different TV shows. She doesn't think that Janey's new behavior, which includes making out with boys and drinking, is cool. Bindy thinks she's alone; but she's not. Her brother, who she thought of as the guy who disappears into his room to play computer games, turns out to be an ally. And she discovers that not everyone at school sees Janey and her new friends as the A List. Being Bindy has a refreshing family dynamic that is neither too perfect nor overly dramatic. Bindy and her brother Kyle don't have a perfect relationship; but they do have a realistic one, and both grow up just enough to appreciate each other. Bindy's parents are divorced, and she lives with her Dad. Her mother is self involved and selfish. Mom is annoying; and Bindy gets annoyed at her; but Mom is refreshingly honest in knowing her own flaws and doing the best that she knows how. There is a wonderful scene when Bindy realizes that not only is Mom paying child support; she is also paying alimony; and that without that money, her father wouldn’t be able to pay the bills. The realization hits her that her father, who is living his dream job but isn't financially responsible for himself or for his children, is in this way just as selfish as her mother, who prefers parenting on weekends. Bindy is young; but eighth graders are young. As she faces all the things that can make school horrible, she grows stronger but is not forced to grow older. This is not a book where Bindy discovers that makeup is fun and wow, Janey's right; it is fun to date boys. Rather, Bindy grows up, by seeing the flaws in others and accepting them and loving them despite the flaws. She finds a place for herself by being herself – by being Bindy. This book is by an Australian writer, so contains some words that readers may not understand at first. The Australian slang is part of the charm of the book, and it's easy to figure out that "bagging out Dad" meant saying mean things about Dad. And while I'm saying "eighth grade" and the book jacket says eighth grade, rest assured that Bindy and company refer to it as Grade 8. Originally appeared in the May 2006 issue of The Edge of the Forest. Acksherlly, we call it Year 8 here down under. Not that I mean to bag you out ;-) Glad you liked it! I guess that means I've watched to much canadian tv, and not enough australian, and actually I'm not even sure if there is any Australian TV offered by my cable company. Huh. I wondered why they didn't go wth Year 8, then?